Speed 40 ft., climb 40 ft., fly 80 ft. Bite. Melee Weapon Attack: +14 to hit, reach 10 ft., one target. Hit: 19 (2d10 + 8) piercing damage plus 7 (2d6) fire damage. Claw. Melee Weapon Attack: +14 to hit, reach 5 ft., one target. Hit: 15 (2d6 + 8) slashing damage. Tail. Melee Weapon Attack: +14 to hit, reach 15 ft., one target. Hit: 17 (2d8 + 8) bludgeoning damage. Frightful Presence. Each creature of the dragon's choice that is within 120 feet of the dragon and aware of it must succeed on a DC 19 Wisdom saving throw or become frightened for 1 minute. A creature can repeat the saving throw at the end of each of its turns, ending the effect on itself on a success. If a creature's saving throw is successful or the effect ends for it, the creature is immune to the dragon's Frightful Presence for the next 24 hours. Fire Breath (Recharge 5–6). The dragon exhales fire in a 60-foot cone. Each creature in that area must make a DC 21 Dexterity saving throw, taking 63 (18d6) fire damage on a failed save, or half as much damage on a successful one. The dragon can take 3 legendary actions, choosing from the options below. Only one legendary action option can be used at a time and only at the end of another creature's turn. The dragon regains spent legendary actions at the start of its turn. Wing Attack (Costs 2 Actions). The dragon beats its wings. Each creature within 10 feet of the dragon must succeed on a DC 22 Dexterity saving throw or take 15 (2d6 + 8) bludgeoning damage and be knocked prone. The dragon can then fly up to half its flying speed. The odor of sulfur and pumice surrounds a red dragon, whose swept-back horns and spinal frill define its silhouette. Its beaked snout vents smoke at all times, and its eyes dance with flame when it is angry. Red dragons lair in high mountains or hills, dwelling in caverns under snow-capped peaks, or within the deep halls of abandoned mines and dwarven strongholds. Caves with volcanic or geothermal activity are the most highly prized red dragon lairs, creating hazards that hinder intruders and letting searing heat and volcanic gases wash over a dragon as it sleeps. With its hoard well protected deep within the lair, a red dragon spends as much of its time outside the mountain as in it. 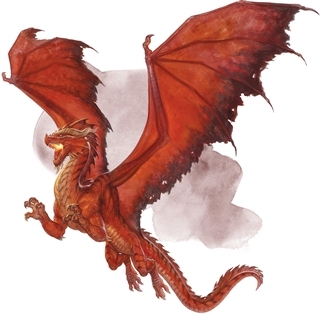 For a red dragon, the great heights of the world are the throne from which it can look out to survey all it controls—and the wider world it seeks to control. Throughout the lair complex, servants erect monuments to the dragon’s power, telling the grim story of its life, the enemies it has slain, and the nations it has conquered. Magma erupts from a point on the ground the dragon can see within 120 feet of it, creating a 20-foot-high, 5-foot-radius geyser. Each creature in the geyser’s area must make a DC 15 Dexterity saving throw, taking 21 (6d6) fire damage on a failed save, or half as much damage on a successful one. A tremor shakes the lair in a 60-foot radius around the dragon. Each creature other than the dragon on the ground in that area must succeed on a DC 15 Dexterity saving throw or be knocked prone. Volcanic gases form a cloud in a 20-foot-radius sphere centered on a point the dragon can see within 120 feet of it. The sphere spreads around corners, and its area is lightly obscured. It lasts until initiative count 20 on the next round. Each creature that starts its turn in the cloud must succeed on a DC 13 Constitution saving throw or be poisoned until the end of its turn. While poisoned in this way, a creature is incapacitated. Small earthquakes are common within 6 miles of the dragon’s lair. Water sources within 1 mile of the lair are supernaturally warm and tainted by sulfur. Rocky fissures within 1 mile of the dragon’s lair form portals to the Elemental Plane of Fire, allowing creatures of elemental fire into the world to dwell nearby. If the dragon dies, these effects fade over the course of 1d10 days.